What kind of tackle twill do you use? We use the same high quality tackle twill used by most professional and college teams. In fact, we have done work for many professional, college, high school and amateur teams. How do you measure lettering? Always give the measurement of the top layer. 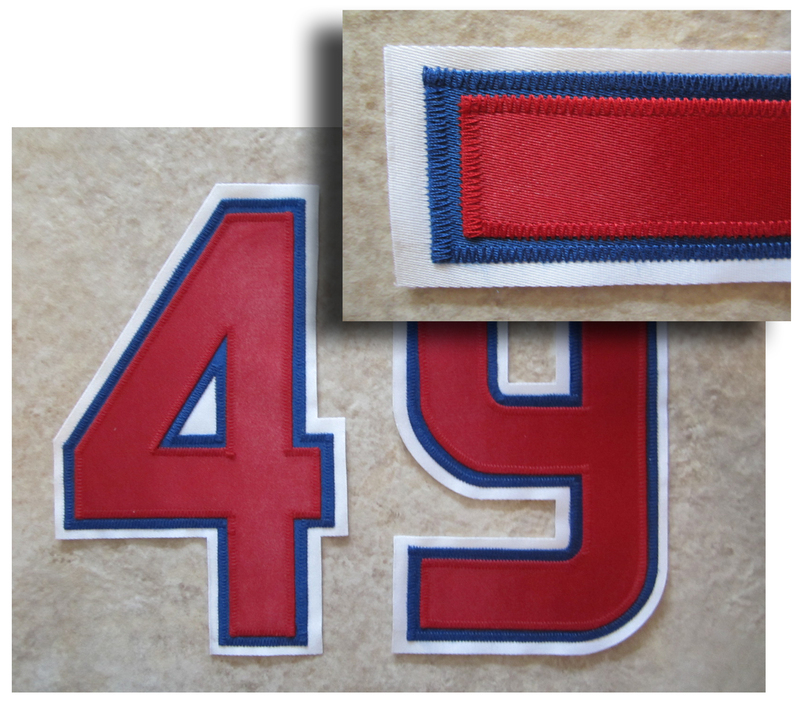 For example, the default size for a 1-color "Varsity" number for the back of a baseball jersey is 8"... the default size for a 1-color "Block" number for the back of a baseball jersey is 7 1/2." How do you describe the color combination for 2-color and 3-color lettering? Always give the top layer of the lettering first. For example "red on royal blue" or "red on royal blue on white." CLICK HERE for an example of "red on royal blue on white." How do I choose the correct colors for my lettering? Color choices can be confusing! Some colors are similar. For example, "royal blue" is the color used by the Cubs and Royals and football Giants. "Mid Blue" is a color more like the blue used by the football Lions. Most customers prefer "grey" for their silver/grey trim. An example of "Metallic silver" is some of the lettering for the Mariners or the trim on the Rockies logo. The "metallic" tackle twills are used mostly by cheer and dance teams. If you have any questions, please feel free to send us an email. Do you customize individual jerseys? Unfortunately we no longer customize individual jerseys. You can order lettering for a single jersey and have a local seamstress sew the lettering to your jersey. We have found that it is a cheaper option for our customers (saves the shipping costs back and forth!). How do you apply tackle twill lettering to a jersey? Most of our customers heat press or iron our lettering to their jerseys. Tackle twill lettering should always be zig-zag stitched around the edges to keep the lettering from fraying (and to keep the lettering from coming off in the wash! Why can't I call in an order over the phone? It is important to use our order forms for ordering. The forms send your lettering specifications directly to our production chart. That way we have a written record of your order. We have found that this method improves accuracy and efficiency! All tackle twill work is computer-generated custom cut by our lettering experts. Some orders may take a little extra time. You will receive a shipping notification when your order is sent. Unfortunately, our payment system and shipping scale is set up for USA orders only. We currently do not accept international orders. Can you match the fabric of my jersey for my nameplate? We have quite a variety of fabrics available for nameplates. "Dazzle" fabric is a good choice for many football jerseys. "Dimple Mesh" is a good choice for most hockey jerseys and many football jerseys as well as today's high tech baseball jerseys. Send us a picture of your jersey if you are not sure, and maybe we can help recommend a fabric.